The Huawei Glory Play 5X is now available for pre-orders from Chinese on-line retailers VMall and TMall. The handset, available in two variations, is another handset from China with a metal body, and a fingerprint sensor. These models, like the Meizu Blue Charm Metal, are being priced in the "affordable" category. The Glory Play 5X is no different. One version of the handset comes with 2GB RAM and 16GB of native storage, and is priced at the equivalent of $157 USD. The other variant features 3GB of RAM and carries 32GB of internal memory. That model will cost you the equivalent of $220 USD. You can pre-order both units right now, with the device officially being released on November 3rd. The Huawei Glory Play 5X is equipped with a 5.5-inch display with a resolution of 1080 x 1920. That works out to a 400ppi pixel density. A Snapdragon 808 SoC is under the hood, with a hexa-core 1.8GHz CPU and the Adreno 418 GPU. The 13MP rear camera has an f/2.0 aperture and OIS. The front-facing 5MP camera takes selfies and handles video chats. A 128GB capacity microSD slot is available for those desiring additional memory, and a 3000mAh battery keeps the lights on. Android 5.1.1 is pre-installed. The Glory Play 5X offers 4G LTE connectivity, and is available in Sunset Gold, Silver Dawn, and Dark Gray. Huawei snapping this year. First come out with the 6P than many claim as the BEST android phone out, now this. 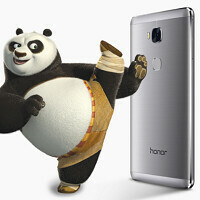 I was happy until I saw Honor, meaning that I will not see this device being shipped to my homeland. Either way this kills Nexus 5X besides Stock Android 6.0. Is has OIS... Well maybe that's a bit exaggerating, but you get the point. Well, it turns out it is Snapdragon 616, so it was too good to be true. Nexus 5x>This. Kinda surprised to see Huawei using 800 series though. Wasn't it called Honor 5X? love the specs on these but I love the design of the G8..